Identical to the widely used Maximum Security swinging door lock, except that the massive laminiated bolts is provided in a hook shape to resist the parting motion of sliding door and jamb. 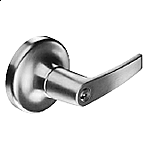 The overcenter MS locking action assures that forced entry attempts to pry the door in any direction, up, down or sideways. will be defeated.